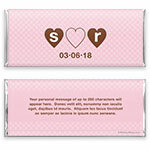 Express your personality with this funky wrapper design. Design: Classic polka dot background with heart initials. Personalization: Front initials and date, back message.